Care homes and volunteers across the country are marking World Alzheimer’s Month with events and person centred activities for their residents. World Alzheimer’s Month, including World’s Alzheimer’s Day which takes place today, is an international campaign to raise awareness and challenge the stigma that surrounds dementia. Marking the occasion, The Fremantle Trust arranged a singing experience for its Apthorp Care Centre resident, Brenda Beard, in New Southgate, London. 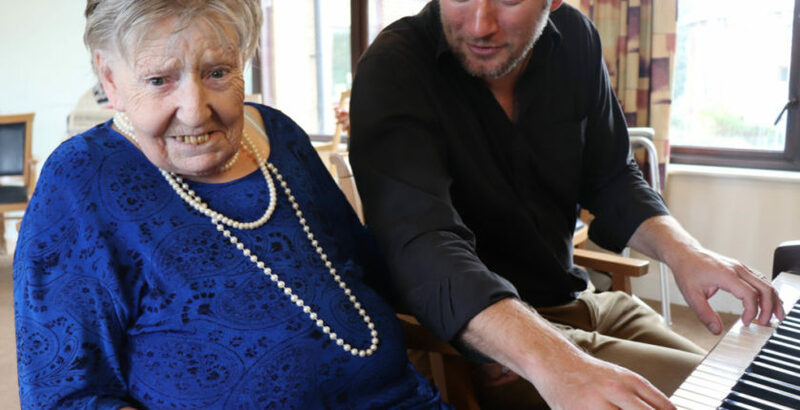 After having made a request for a singing lesson through the Trust’s Wishes and Dreams initiative, Brenda was treated to one-to-one tuition from music therapist, Phil Evans, followed by a performance with fellow residents by the piano. Elsewhere, Linda Shields was honoured with a Dementia Friendly Volunteer of the Year award at the Scottish Parliament yesterday for her work in Stirling. Linda’s volunteering role involves leading three Dementia Friendly Health Walks a week across Stirling, promoting these walks and increasing her own knowledge by attending talks and seminars. On average, Linda devotes over 20 hours a week to volunteering and there has been a 50% increase in participants on these walks thanks to her involvement. Among other upcoming events, Aura Care Living’s Kings Lodge in Camberley is hosting a Memory Walk on behalf of the Surrey Alzheimer’s Society on Saturday October 6. Anyone wishing to join in is invited to come along to Kings Lodge for 10am.